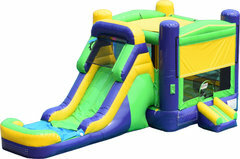 You'll get the best value for rental and the maximum fun factor, when you rent a bounce & slide combo from BounceAndPlayLLC.com. These awesome inflatables get their name from being a "combination" of the popular bounce house and additional fun features like climb & slides all in one. All of our bouncers are manufactured with "Lead-free" vinyl for your child's safety, and all units are cleaned and sanitized after every rental. Browse the selections below and click on the image or "More Info" to get additional details and to make a reservation. A'hoy Combo "Dry Use Only"
Fairy Combo "Dry Use Only"
Radical Combo "Dry Use Only"